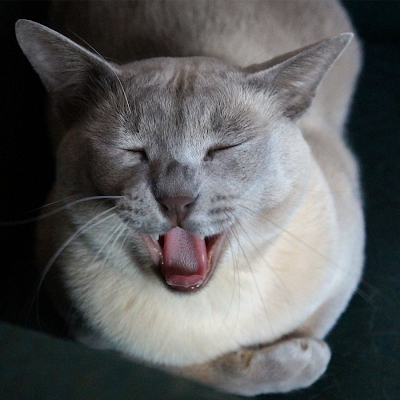 A new series for 2014, inspired by our very own Fang-y Feline, Maxwell. Faraday: "Did you catch them on camera? Look, Max: I've got fangs TOO!" Have a fabulous fangtastic Friday. Cute boy! Not quite as "fang-y" as Maxwell, but still adorable! I don't know but all I see is a big tongue. I bet you're really clean. We see a hint of your fangs, Faraday! LOL! Wonderful photo, we like this series! Allie: Yes that's right Waffles. A certain Brat is best seen from FARAWAY. Oh Mother, might I propose a Name Change...? And possibly a commemorative event that embodies the meaning of the new name? hope everee one haza grate week oh end N stayz outta trubull...KNOT !!! Faraday, you will have to work harder to match Maxwell's fangology! It would be impossible to show as much fang as Maxwell did, but you're always more refined than Maxwell, Faraday! Thursday Trivia: In a pig's eye! Funny But No: Got a Winter Cold? PetSafe FroliCat Giveaway - We have a winner!